In this article, we’ll be comparing the specifications of the Infinix Zero 5 and the Xiaomi Redmi 5 Plus smartphones. 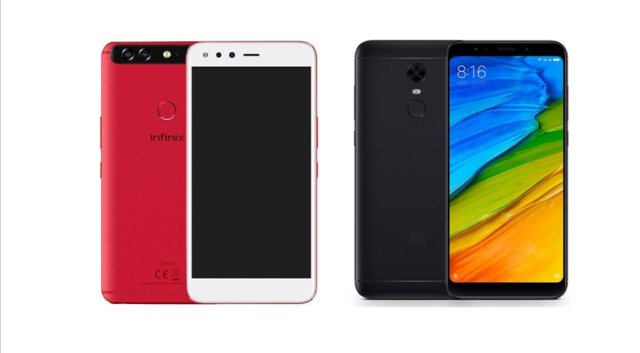 Infinix and Xiaomi are both smartphone maker from the Chinese smartphone market but, with entirely different marketing approaches and targeting. And also, while the Xiaomi Redmi 5 Plus and the Infinix Zero 5 smartphones fall under same segments of smartphone market (Midrange Smartphones), it is important to note that the Infinix Zero 5 is the highest end of Infinix smartphone while the Redmi 5 Plus is Xiaomi midrange phone. So the comparison is like comparing the highest efforts of Infinix mobility with the mid-range effort from Xiaomi. So, let run through a tabular comparison of the attributes of both devices. This is where the difference between the Infinix Zero 5 and the Xiaomi Redmi 5 Plus starts ticking. The display orientation between the Zero 5 and the Redmi 5 Plus are entirely different. While Zero 5 follows the old traditional 16:9 display orientations with Full-HD (1080×1920) display, the Redmi 5 plus on the other hand adopts the current trending 18:9 orientations with a Full-HD+ (2160×1080) display resolutions. What this means is; inspite of the fact that both smartphone have same 5.99 IPS screen, the Xiaomi Redmi 5 Plus will tend to produce better display quality than the Infinix Zero 5 due to more pixel per-inch produced by the Redmi 5 Plus. If well optimized, the Zero 5 should generally produced better image than the Redmi 5 Plus. This is due to the dual rear camera sensors on the Zero 5 to the disadvantages of the single sensor on the Redmi 5 Plus. Not only the that, the presence of the dual rear camera on the Zero 5 should help with depth of field and the popular DSLR bokeh effects. At the front, the Redmi 5 Plus still stand disadvantaged against the Zero 5, since it 5MP vs 16MP. In all, the Infinix Zero 5 should generally be your best option if you intend using it for photo and video shooting purposes. Both devices are powered by an octa-core processor supplied by different OEMs. While the Xiaomi Redmi 5 Plus is powered by Snapdragon 625 by Qualcomm, the Infinix Zero 5 processor is supplied by Mediatek (Helio P25). One key thing to note here is, while both processor are power efficient, the Snapdragon 625 tends to consume lower power and produce lesser heat. Also, the Adreno 506 in the SD 625 might produce better graphics and game experience than the Mali-T880 MP2 in the Helio P25. Another aspect worth mentioning is the memory and storage departments. 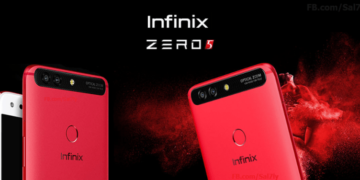 Infinix Zero 5 begins with 6GB RAM and 64GB internal storage. Redmi 5 Plus on the other hand start with just 3GB RAM and 32GB storage. However, the base factor that will determine which of these two device to buy is the price. While the Xiaomi Redmi 5 Plus retails around 159 to 199 Dollars, the Infinix Zero 5 cost above $250. So, which is for you, the Infinix Zero 5 or the Xiaomi Redmi 5 Plus? Do let us know in the comment section below.